We are so excited to have won an award at this years glamorous Event Technology Awards, held at The Troxy in London. 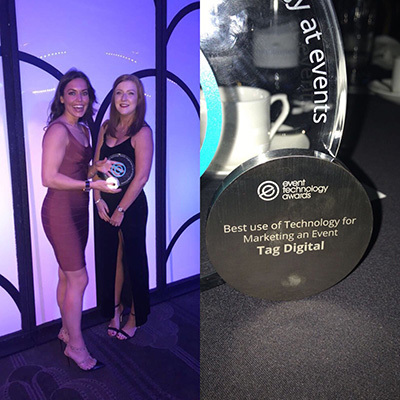 Francesca and Ashley from our team were at the awards night to accept the award for ‘Best use of Technology for Marketing an Event’. It was great to be involved in the event, and to take home an award make it an unforgettable night. Big thanks to everyone at Event Tech Awards for a wonderful night. To the whole team at Tag Digital, you guys are the best!